The counting in Jind in Haryana was marred by violence on Thursday after several supporters of non-BJP parties raised questions on EVMs, used for the counting. The counting had to be stopped briefly after the 8th round saw BJP candidate Krishna Middha taking a significant lead over JJP candidate Digvijay Chautala, who was being supported by the AAP. 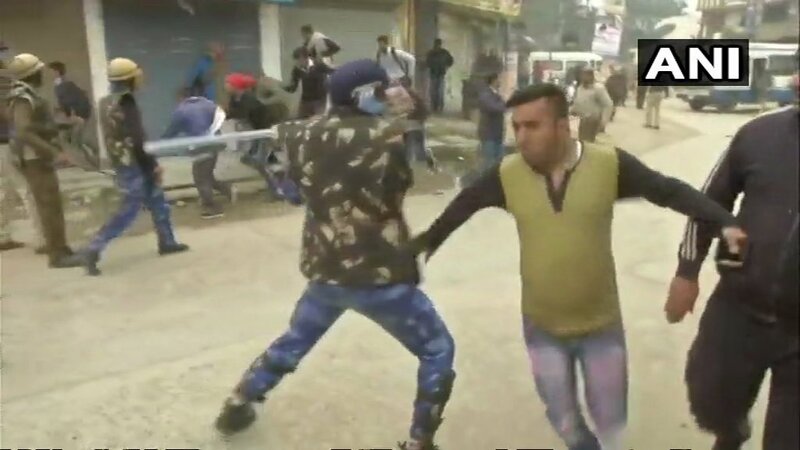 Although the counting resumed after a small break, the scene outside the counting centre remained tense as CRPF personnel and local police used mild force to control the agitating mob. A senior police officer told reporters that the situation had been brought under control because of their prompt intervention. When the counting began, the BJP candidate’s lead remained unaffected. Congress candidate Randeep Singh Surjewala could only secure the third position with 22,740 votes. The JJP had taken significant lead in the early rounds, but its lead changed after the fourth round of counting, when the BJP surged ahead with over 2,000 votes. Today’s results assume significance in light of this year’s Lok Sabha polls. BJP’s victory by 12,905 votes in Jind comes just hours after a poll survey by Times Now said that the saffron party was predicted to win eight out of 10 parliamentary seats in the state, one more than what it had won in the 2014 Lok Sabha elections. Haryana has a BJP government, headed by Chief Minister Manohar Lal Khattar. Today’s development in Jind has once again reignited the debate over the reliability of EVMs. Many opposition parties have been demanding the introduction of ballot papers arguing that the BJP has been tampering with the machines to ensure favourable results. Elsewhere, the Congress on Thursday won the Ramgarh assembly by-electionin Rajasthan as its candidate Shafia Zubair Khan trounced her BJP rival decisively, taking the overall assembly seats won by the Congress to 100 in a 200-seat assembly. BJP’s Krishan Middha secured 49,929 votes, while JJP’s Digvijay Surjewala polled in 37,681 votes. Randeep Surjewala managed just 22,547 votes.